This article first appeared in Enterprise, The Edge Malaysia Weekly, on July 10, 2017 - July 16, 2017. When Dexter Lau was reading law in the UK, his parents were already telling friends that their eldest son was going to be a lawyer. In the late 1990s, this was a big deal for a family running a wholesale business in a small town in Sabah. But Lau did not go down the path his parents had imagined. He practised law for only a year before deciding to help his father run the family business. Kim Teck Cheong (KTC) — established by his grandfather, the late Datuk Lau Yeong Ching, in 1938 — started out as a sundry shop that slowly evolved into a departmental store. Over the years, it transformed into a distributor and trader of fast-moving consumer goods. “My late grandfather had always wanted me to come on board as he hoped the family legacy would be passed on. My father wanted someone to help him out, but he remained neutral on my joining the business, while my mother objected to the idea as she wanted me to explore the world. I think it was because she had seen some family conflicts in the business years ago and thought it was not worth the effort,” says Lau. So, Lau joined the company as general manager before becoming executive director. Under his stewardship, it was listed on Bursa Malaysia’s ACE Market in 2015. Today, KTC Consolidated is one of the largest consumer packaged goods distributors in Sabah, with more than 6,500 distribution points covering over 80 districts. Its product range includes food and beverage, personal care, household, baby care, LED and conventional lighting, plastic food packaging and health supplements. What did Lau do to drive the business forward? The most important thing was digitalisation and innovation, he says. He effectively modernised the company’s operations and brought it into the 21st century. “When I joined the company, it was still a traditional ‘Chinaman’ company with only some computerisation implemented by my father. The operating costs were very low. So, I decided to do something about it,” says Lau. As a start, he bought 15 laptops — the cheapest model in the market, each costing RM4,000 — and distributed them to employees. At the time, for many SMEs, laptops were luxury items that only top management had access to. He embraced Six Sigma — a set of management techniques intended to improve business processes by reducing the probability of occurrence of an error or defect. He also initiated business process reengineering (BPR), a popular management strategy at the time. BPR focuses on the analysis and design of workflows and business processes. It aims to improve efficiency and effectiveness as well as cut down operational costs. “Usually when the younger generation takes over, some long-serving staff will be let go, as it marks a new era. But this was not the case for KTC. I retained the old staff and helped them adapt to the new age of technology. They are quite proud of what they have learnt on the journey,” says Lau. He was able to do that as BPR improved its business processes by leveraging new systems and procedures, throwing out redundant procedures and adding new processes that act as a check and balance mechanism. It was not all plain sailing, though. Lau says some of the staff did not react well to his management style and resigned. But they were soon replaced. Word had got out that he was transforming the business, so it started to attract younger, more educated talent who were excited about the prospects of the business. “After some time, the staff fully embraced the new direction of the company. They figured out how to use their new laptops. I only showed them how to handle certain situations such as a sudden shutdown or if the computer hung,” he recalls. From there, Lau constantly improved the company’s value-added processes and removed the less beneficial ones. For example, if a document only needed a signature from the human resources department, it did not have to go through other departments. This helped reduce mistakes and duplication of effort. He also set up various departments — human resources, IT and sales — and appointed department heads. This was very different from the old days when one person (usually a family member) wore multiple hats. The changes Lau instituted started to bear fruit. The company was more efficient than before and started seeing healthy growth. So, he decided to up the ante. “We moved our entire IT infrastructure and core applications such as SAP Business One and Microsoft Dynamics Customer Relationship Management from a local hosting provider to Amazon Web Services (AWS) in 2014,” he says. Lau was unhappy with the previous provider because it kept delaying the work and increasing the cost. With AWS, he was able to grow his business and expand the company’s structure without worrying about server costs, hardware maintenance or unexpected delays. However, AWS was only part of his grand scheme. He also worked with multiple solution providers for the company’s digitalisation. For instance, he worked with Payroll2u — a payroll outsourcing company in Singapore — so the company could access its human resources system from a mobile application. “I believe in outsourcing. It is the way to go if you want to get services and advice from professionals in various industries. But your company may not be able to hire them all at once. Outsourcing helps to keep the company lean,” says Lau. He employed most of the outsourcing solutions when KTC was still an SME. “It may seem expensive for some SMEs as they can do it in-house with a one-man show. These solutions will incur additional costs. But we want to get the greatest advice from the best professionals. We could not afford the best talents yet, so outsourcing was our best bet. I think it was well worth the cost,” he says. Looking back, the 38-year-old says the journey has been rewarding. 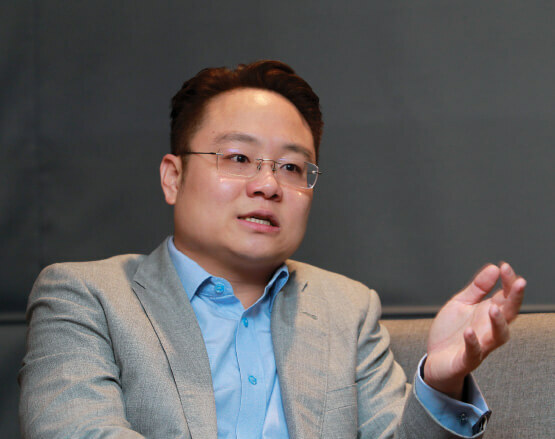 The most unforgettable incident was how he convinced his father, Datuk Lau Kok Sing, to go for an initial public offering about five years ago. “My father did not like the idea of going for listing because he felt it was only for companies in dire need of capital. I remember how I tried to talk him out of this misconception. I had done a lot of research and calculations, and started writing these down on the windows, using a marker pen. When I ran out of windows, I resorted to writing on the floor. “It lasted for a few hours. When my father finally seemed convinced, I thought my job was done. But it wasn’t. He asked me to clean the floor and windows. I spent an hour trying to get rid of my own writing. But it was all good because my father and the rest of the family gave the green light for the listing plan,” Lau laughs. His younger brother and sister are medical doctors. They have no plans to join the family business. “I think they are happy with what they are doing and are not interested in running a business. Another reason is that they have seen how hard I worked all these years and are terrified of it,” he jokes.